No pressure — buy at your own pace. Now is the time to replace your old sectioned gutters with new seamless gutters. Seamless gutters are better constructed then sectioned gutters, allowing them to do a better job of protecting your foundation and windows from decay and rot. 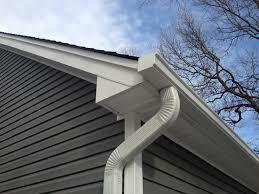 Seamless gutters eliminate the leaky joints that cause those problems. Not only are seamless gutters an attractive addition to your home, they are more functional and easier to maintain. For a free estimate, contact us today.